We love the library. I mean...c'mon! Who doesn't love the library?! For me, it's like retail therapy. Only it's free. And Bella just loves picking out the books and DVDs and being able to check them all out on her own with her OWN card. This week we met up with our friends...and it was so fun, I think it will become a weekly occurrence for all of us. 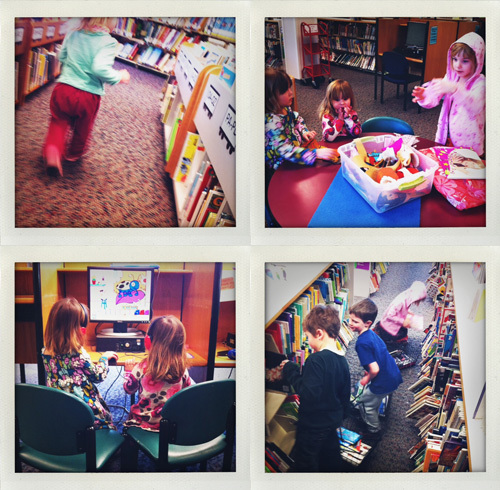 The Longmont library is really set up nice for all ages and we feel so blessed. We have found some really WONDERFUL books there lately, and I wanted to share them with you. These are books that Bella keeps asking to read again and again. All The Places To Love: This book has the most AMAZING illustrations. And there is a homebirth in it. I adore this book. Sometimes we just sit and stare at the paintings in silent awe. 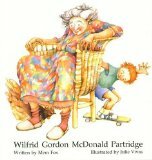 Wilfrid Gordon McDonald Partridge: This one also has fabulous images...it's about a little boy who lives next door to and "old folks home". He helps one of the old women "find her memories again". Super sweet. What children's books are you reading and loving right now?